This is my first collection of poems, containing pieces written between 1975 and 1979, many of them set in the North of England. 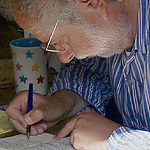 'How He Changes' is the earliest completed poem, dating from the summer of 1975. The book was published by John Welch of the Many Press, London, in November 1980. He was among the first small press publishers to take any notice of my work and also published a poem called 'Going Out to Vote' in a broadsheet in 1978, and two pamphlets, one of Vittorio Sereni translations in 1983, and one of my own poems, Anaglypta, in 1985. 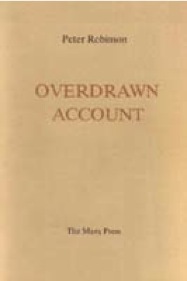 Overdrawn Account received a half dozen reviews in poetry or literary magazines, most of them positive or mixed. The short story writer and poet, James Lasdun perceptively wrote in Siting Fires that 'one senses occasionally that Robinson is a poet who would rather be a painter. Nevertheless, he is a poet, and one with a sensibility which, if attuned only to a somewhat limited range of experience, is unusually refined.' The critic Eric Griffiths struck a similar note in the PN Review when he concluded his review by stating that 'Peter Robinson is in my judgement the finest poet of his generation'.